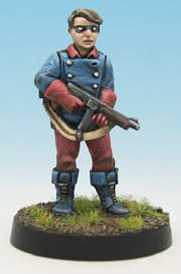 This is the first of many entries on stuff that I personally use in my WWWII wargaming so with no further ado I’ll start with my favorite miniature of all time; Captain America and Bucky circa 1944. These two minis are from a very sought after limited edition set that truly embodies the costumed superheroes of the 1940s Golden Age of comics. What we have is none other then Captain America and his youthful partner Bucky geared-up and ready to give what fore to those Nazi and Jap bastards. These minis are truly a must for any WWWII player or even Cap fan! 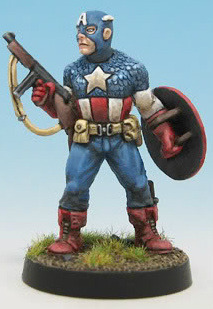 The metal minis were sculpted by Aaron Brown of Black Crab Studios and is “Heroic 28” (32mm) in size. Cap came with both his original and classic shield so you can pick which one you want but its the round one for me and my gaming. Gotta give Cap his chance to throw that thing off of ol’ Red Skull’s skull! Both are armed and equipped with WWII American kit and weapons and really show how they might have looked if real. These minis are great and worth the price so check my ebay listing and you might just get lucky in getting a set. The above set was painted by Alden Miranda under commission. A must for any Weird WWII wargamer or fan! Here are the BGWWWII rules for Cap and Bucky.